بهنژادی, محمدعلی, ظفری غازانی, سید حامد. (1393). بررسی سینتیک حذف پارانیتروفنل توسط فرایندUV /S2O8 2- در یک فتوراکتور جریان پیوستة آنولار. 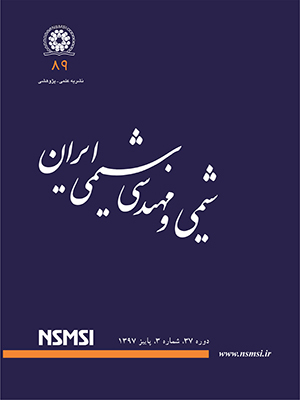 نشریه شیمی و مهندسی شیمی ایران, 33(3), 1-6. محمدعلی بهنژادی; سید حامد ظفری غازانی. "بررسی سینتیک حذف پارانیتروفنل توسط فرایندUV /S2O8 2- در یک فتوراکتور جریان پیوستة آنولار". نشریه شیمی و مهندسی شیمی ایران, 33, 3, 1393, 1-6. بهنژادی, محمدعلی, ظفری غازانی, سید حامد. (1393). 'بررسی سینتیک حذف پارانیتروفنل توسط فرایندUV /S2O8 2- در یک فتوراکتور جریان پیوستة آنولار', نشریه شیمی و مهندسی شیمی ایران, 33(3), pp. 1-6. بهنژادی, محمدعلی, ظفری غازانی, سید حامد. بررسی سینتیک حذف پارانیتروفنل توسط فرایندUV /S2O8 2- در یک فتوراکتور جریان پیوستة آنولار. نشریه شیمی و مهندسی شیمی ایران, 1393; 33(3): 1-6. در این کار پژوهشی از یک فتوراکتور پیوسته آنولار مجهز به یک لامپ UV-C در مرکز فتوراکتور با طول موج نشری nm254، برای حذف یک آلایندة مدل (پارانیتروفنل) با استفاده از فرایند-UV/S2O82 استفاده شده است. در این پژوهش، برای اولین بار یک معادلة سینتیکی جامع برای فرایند-UV/S2O82 ارایه شده است. ثابت سرعت واقعی واکنش رادیکال‌های -S2O82 با مولکول‌های پارانیتروفنل با مدل‌سازی سینتیکی برابر با 105 × 1/1 به‌دست آمده است. مدل به دست آمده از نتیجه‌های بررسی سینتیک فرایند بر مبنای مکانیسم داده شده، به خوبی می‌تواند غلظت پارانیتروفنل را در این فرایند در شرایط عملیاتی گوناگون همچون غلظت اکسید کننده، شدت جریان حجمی سیال و طول فتوراکتور پیوسته تعیین کند. Hao O.J., Kim H., Chiang P.-C., Decolorization of Wastewater, Critical Reviews in Environmental Science and Technology, 30: 449-505 (2000). Behnajady M.A., Modirshahla N., Daneshvar N., Rabbani M., Photocatalytic Degradation of an Azo Dye in a Tubular Continuous-Flow Photoreactor with Immobilized TiO2 on Glass Plates, Chemical Engineering Journal, 127: 167-176 (2007). Legrini O., Oliveros E., Braun A.M., Photochemical Processes for Water Treatment, Chemical Reviews, 93: 671-698 (1993). Behnajady M.A., Modirshahla N., Shokri M., Photodestruction of Acid Orange 7 (AO7) in Aqueous Solutions by UV/H2O2: Influence of Operational Parameters, Chemosphere,55: 129-134 (2004). Daneshvar N., Behnajady M.A., ZorriyehAsghar Y., Photooxidative Degradation of 4-Nitrophenol (4-NP) in UV/H2O2 Process: Influence of Operational Parameters and Reaction Mechanism. Journal of Hazardous Materials, 139: 275-279 (2007). Mazellier P., Rachel A., Mambo V., Kinetics of Benzenesulfonates Elimination by UV and UV/H2O2, Journal of Photochemistry and Photobiology A: Chemistry, 163: 389-393 (2004). Behnajady M.A., Modirshahla N., Evaluation of Electrical Energy per Order (EEO) with Kinetic Modeling on Photooxidative Degradation of C.I. Acid Orange 7 in a Tubular Continuous-Flow Photoreactor. Industrial and Engineering Chemistry Research, 45: 553-557 (2006). Lin C.-C., Lee L.-T., HsuL.-J., Performance of UV/S2O82− Process in Degrading Polyvinyl Alcohol in Aqueous Solutions, Journal of Photochemistry and Photobiology A: Chemistry, 252:1-7 (2013). Hori H., Yamamoto A., Hayakawa E., Taniyasu S., Yamashita N., Kutsuna S., Kiatagawa H., Arakawa R., Efficient Decomposition of Environmentally Persistent Perfluorocarboxylic Acids by Use of Persulfate as a Photochemical Oxidant, Environmental Science and Technology , 39: 2383-2388 (2005). SalariD., DaneshvarN., NiaeiA., Aber S., RasoulifardM.H., The Photo-oxidative Destruction of C.I. Basic Yellow 2 Using UV/S2O82− Process in an Annular Photoreactor, Journal of Environmental Science and Health Part A, 43: 657-663 (2008). Levenspiel O., ″Chemical Reaction Engineering″, John Wiley, N.Y. (1972).